James Smith Isbister was the 5th child of 11 children born to David Isbister and Betsy Kirkness. He was born in the Orkney Islands of Scotland on the 23 October 1864. There were 7 boys and 4 girls in the family, only two of the girls reached adulthood. Five of the boys emigrated overseas: two to Australia, two to Canada and one to the USA. His father was a farmer and mason. James was not well educated as was common in those times in the Orkney Islands as he started working as a herder at the age of 8 and only went to school for part of the year. He had only been at school for two and a half years in his whole life, and that was spread over five years; his education was little more than made it safe for him to write “Yes”, without committing perjury, on the dotted lines after the usual questions, “Can you read? Can you write? James Smith Isbister arrived in Maryborough Qld on 3 January 1883. He was only 17 years when he left Orkney Islands and had his 18 birthday aboard ship. The ship he arrived on, the "Shenir', had left from Glasgow Scotland. There was a condensing plant on board the “Shenir”, in charge of a donkey-man, as the hard boiled old sailor was known. A friendship sprang up between James and the donkey-man one of those friendships for which it is hard to account. The donkey-man seeing the interest that James took in pistons, cranks, pumps and the like, asked him to come into the donkey-house, and get a closer view. He explained the principle of condensing or distilling to him and the functions of the pumps and other mechanical contrivances, and gave a standing invitation to come every day. Many hours were spent each day in the condensing room; James was soon able to work the plant. This was continued as long as the voyage lasted, and this experience was to be of great benefit to James later in life. James spent his early years in Australia in the Maryborough to Gympie area mostly around Bauple and Tiaro. James first job in Australia was with Mr Joe Bates who offered him work on his farm at Bauple. James Isbister celebrated his 19 birthday while working for the Bates family. Other jobs in the area included fencing, driving a bullock team and in a sawmill at Gundiah. James Isbister married Isabella Munro on 12 May 1887 at Gympie, Qld. Although James and Isabella both came from the Orkney Islands they first met in Australia. They had seven children: David, Alice, Eliza, May, Annie, George and James. Six of their children were born while living in Bauple. Their youngest son James was born in Mossman and died as a baby. He bought a piece of land in Bauple and built a house there in 1895. James built the house for his family single handed except for a man for half a day to saw off the top of the house blocks and a lad for 4 days to carry shingles on the roof. All the shingles for the roof of the house were cut from one tree and each had one nail hole bored into it. The shingles formed the roof of the house similar to tiles today. 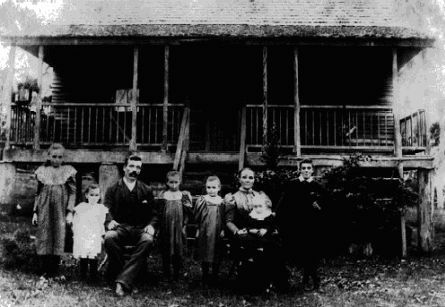 James and Isabella Isbister and family in front of the house he built at Bauple, south of Maryborough Queensland in 1895. They are left to right Alice, Annie, James, Eliza, May, Isabella, with George on knee and David. Photo was taken Christmas 1899. James Isbister worked at the Bauple Sugar Mill when it was being built. Then later he worked in the mill as a fitter. This was the beginning of James employment being that of a general labourer to an Engineer. In his early years in Australia, James spent many of his nights studying by candlelight in attempt to better his work situation. These studies proved fruitful, he became second engineer at the Mossman Sugar Mill in 1900 and in 1906 Chief Engineer at Marian Sugar Mill. The rest of his working life was spent as Chief Engineer. The other sugar mills in which he worked in North Queensland were, Pioneer, Pleystowe and Farleigh. 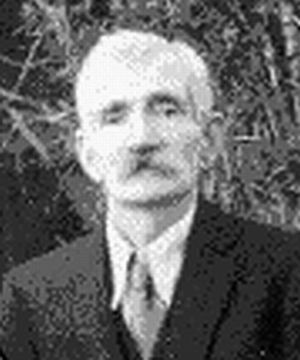 James retired as a Chief engineer in 1926. After he retired James became engaged in a soft drink and cordial manufacturing business with his eldest son David at Walkerston near Mackay. James spent the remainder of his life after retirement at Walkerston. James died in Mackay on 29 September 1942 aged 78 years. 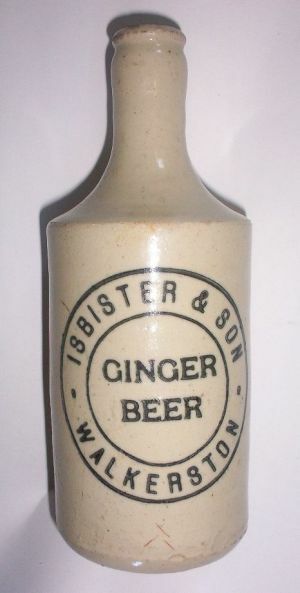 Isbister & Son Stone Ginger Beer Bottle.